Global markets have bridged the boundaries between trade and communication like never before. The advent of e-commerce has transformed the Internet into a huge marketplace as new companies are launched daily. The first rule of an e-commerce business is to retain their customers by offering a positive buying experience. The two main touchpoints in e-commerce business are mobile and website. Most users today prefer to shop online through a mobile app rather than a website, and many businesses make the mistake of neglecting their mobile app or worse, not offering one at all. One-third of all e-commerce purchases during the 2015 holiday season were made on a smartphone. 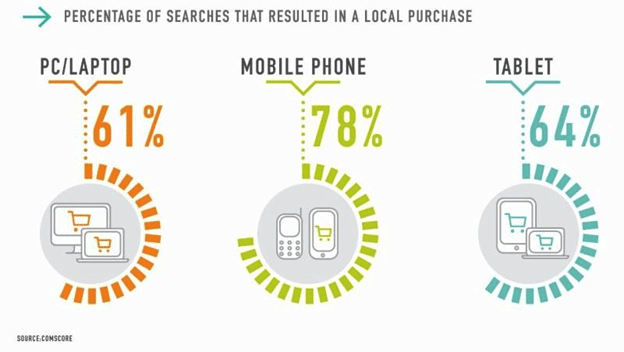 80% of shoppers have used a mobile phone while inside a physical store to either look up product reviews, compare prices, or find alternative store locations. Intuitive design: The design of your e-commerce store plays a key role in how buyers perceive your app. Users have an attention span of less than 8 seconds, so it’s essential to keep your app simple. Complicated designs are generally not effective. Security: Security is an essential part of e-commerce mobile app development. Vendors ask for a lot of user information, such as bank account details, credit/debit card info, address, etc. You must ensure that your app is safe and secure to use and there are no security loopholes. Great images: Studies show that visual information can be processed 60,000 times faster than text. In e-commerce, images communicate your brand and product. Make sure that your images effectively communicate brand value. Social media integration: Your e-commerce app must be integrated with social media sites. This allows the users to directly connect with your app through their social media profile without the need to fill in registration forms. You can also enable users to share their shopping experience on social media, which can help boost your business’s reputation. Simple navigation: Consider the content and screen size of your mobile app. Mobile phone screens have limited space, so ensure that your app and its content are clear and legible. Layout should be simple and neat and navigation should be seamless and responsive, automatically fitting into any screen size and resolution. Google analytics: The objective of an e-commerce mobile app is to earn revenue. Therefore, your app should include analytics to help you understand consumer behaviors and buying patterns. Google Analytics for Mobile Apps measures your app’s full value. Session time, cost of conversion, click-through rates, and accessing custom fields all provide valuable information about consumer behavior. Push notifications: Push notifications are an important feature for mobile apps, providing users with marketing content like exclusive promotions, special offers, and new product launches. This feature can be paired with analytics to boost sales. All payment options supported: If a buyer wants to buy a product from a specific mobile app but is unable to do so because the site does not support their preferred payment method, this will likely result in a lost sale. Include all possible payment options on your mobile app. Relevant app content: The content of your app should be concise and to the point. Do not overwhelm customers with marketing information; keep content relevant and compelling. Easy checkout: Shoppers abandon their cart during the checkout process for many reasons: pricing issues, competition, better alternatives, etc. If your checkout process is complicated, your customers are more likely to abandon their cart. So keep the process simple and direct. Also, offer additional products a user might want as they check out. Amazon: The leading online e-commerce site provides an excellent shopping experience to users. The app is light and fast and allows you to search and filter a wide range of products with just a few clicks. It also provides multiple payment gateway options for easy checkout and a complete update on your order status as it progresses. Amazon also offers users the option to shop without registering, or to register at the end of the checkout process with only a phone number or email address. eBay: eBay’s mobile app offers online bidding on to customers around the globe. The app provides search options that enhance the buying and selling experience, along with features like barcode scanning for price comparisons, autocomplete searches, guest checkouts, linking of Paypal accounts for quicker transactions, and much more. eBay app also gives alerts about the latest auctions, time remaining in auctions, and bid status. An e-commerce mobile app should provide a complete and unique user experience that makes online shopping simple and fun while also driving sales and boosting revenues. Already preferred over mobile websites, mobile apps can leverage many opportunities as the future of e-commerce develops.